Osaka/Chiba, Japan - Panasonic Corporation and Chiba Institute of Technology have jointly developed the concept model of a next-generation robot vacuum cleaner - an advanced high-performance intelligent home appliance working with the latest artificial intelligence (AI), autonomous driving, and robotics technologies. The concept model features the world's first AI floor sensor with advanced intelligence achieved by deep learning. It recognizes an object on the floor and climbs over stepped surfaces by automatically lifting its body, thus continuing movement without a hitch. This model utilizes a high-speed spatial awareness technology called ScanSLAM,* which is original to the Chiba Institute of Technology's Future Robotics Technology Center (fuRo), that enables the model to detect the shape of a room as well as a person moving in the room. This robot vacuum cleaner is thus intelligent enough to recognize moving or still objects around it and instantaneously identify its own location and the objects' locations. The autonomous driving technology allows the user to remotely control the robot, using his/her tablet terminal, by sending an instruction indicating the spot to be cleaned or even an instruction to cooperate with a person in the cleaning work. By always correctly understanding its surroundings and its location, the robot is able to travel back to the charging station without losing its way. In addition, the robotics technology has given a power-operated function to the robot for lifting its body into the vertical position after being connected to the charging station. Aiming at the development of technologies for next-generation robotics home appliances, Panasonic and Chiba Institute of Technology jointly established, in December 2017, the "Panasonic/Chiba Institute of Technology Industry-Academic Collaboration Center" at the institute's Tsudanuma Campus. The engineers from both the university and Panasonic have gathered at this center and proceeded with joint development work through cooperative efforts that broke down barriers between the university and the corporation under the strong leadership by Takayuki Furuta, General Manager of fuRo. The engineers combined processes for utilizing and comprehensively developing software and hardware basic modules, which have been devised by the Chiba Institute of Technology during its long years of robotics research, with the capabilities of planning and developing highly reliable home appliances, which have been nurtured by Panasonic though its long years of operation. Consequently, the joint engineering team could tackle agile development requiring the repeated prototyping process to make improvements in a short period of time while integrating software and hardware resources. Successful in their efforts, the engineers managed to create the concept model in about three months, which is an unprecedentedly short period for developing a highly intelligent home appliance. The concept model was jointly designed by Shunji Yamanaka, a world-renowned product designer, and Panasonic's designers. This has given the model development process another feature - promotion of open innovation in the fields of both design and engineering. The newly developed model will undergo a series of verification tests, and it is expected to be put to practical. Both the Institute and Panasonic believe that incorporating AI, IoT, and robotics technologies into home appliances that support customers' life with higher performance will lead not only to improved functions in individual products but also to the creation of safer and more convenient products that offer customers a rich experience through links to various equipment and services. They will apply this open and agile development process we have just adopted for the development of other intelligent home appliances and aim to create a better life for the customers. 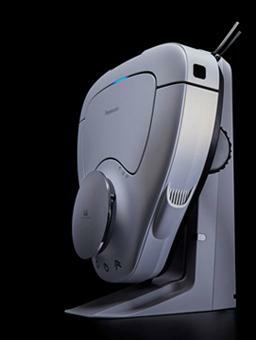 *ScanSLAM is a high-speed, high-precision SLAM technology developed by the Chiba Institute of Technology's fuRo. Robotics Symposia 2017 & 2018 "Excellent paper award"
SLAM (Simultaneous Localization and Mapping) is a core technology that functions similarly to human vision for autonomous driving devices and robots. This technology analyzes data from a sensory device, such as a laser or camera, to identify the location of the autonomous driving device or robot while creating a map of its surroundings. 1) Cleaning the whole house without making useless movements, stumbling, or losing its way. - This robot vacuum cleaner adopts the high-speed spatial recognition technology ScanSLAM,* which is one of the most advanced spatial awareness technologies in the world, developed by fuRo, and it is already used in various fields. 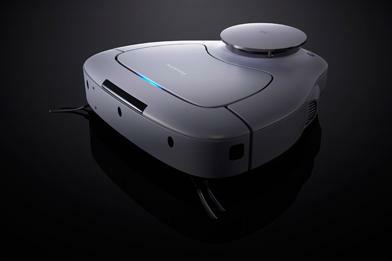 Equipped with a 360-degree laser sensing system, this robot vacuum cleaner recognizes the shape of a room as well as a person moving in the room, thus offering a "next level spatial awareness capability" than the conventional robot vacuum cleaners. It recognizes space using real-time detection to create a map and accurately identify its location in traveling. In this way, it cleans every corner of the house efficiently without making any useless actions. - Carrying the world's first "AI floor sensor," the robot vacuum cleaner recognizes an object on the floor using output signals of its plural laser distance sensors, thanks to its intelligence achieved by deep learning, one of the latest AI technologies. When detecting a rug or the like, it automatically lifts its body to climb over the stepped surface created by the rug and continues to move smoothly without stumbling over anything. - If the robot vacuum cleaner goes to a location where it can not see the charging station, its AI technology allows it to always know where to return and thus allows it to reach the station without losing its way. After finishing its cleaning work, the robot increases running speed and travels quickly back to the charging station. - A combination of the ScanSLAM,* which allows the robot vacuum cleaner to have accurate location information, and state-of-the-art autonomous driving technology, which is also used in vehicles, enables the user to easily specify a destination with his/her tablet terminal and then make the robot run to the destination. - A combination of the moving object recognition technology achieved by ScanSLAM* and a motion predictive control technology achieved by AI technology lets the robot vacuum cleaner follow a person as if it is accompanying the person (otomo function). If the user walks in an area he/she wants the robot vacuum cleaner to clean up, it cleans there as it follows him/her. This is convenient and fun. It's the sort of cleaning work that the user and the robot can carry out as a team. Once the robot vacuum cleaner finishes its cleaning chore, it fits itself accurately in the charging station through a function that allows its body to communicate with the charging station. After sitting securely in the charging station, the robot is automatically lifted into a vertical position for charging. This saves more space than the conventional method of charging the robot in a horizontal position. Future Robotic Technology Center (fuRo, General Manager: Dr. Takayuki Furuta) is the robotic technology research base of Chiba Institute of Technology, which has the longest history of all the technology institutes in Japan. At RoboCup 2014, a fuRo team dominated the competition by winning all four competition categories in Humanoid League. At RoboCup 2018, the same team won the Technical Challenge and achieved seven consecutive victories. And, the other fuRo team became the first team to fulfill the mission for the third consecutive year in the autonomous mobile robot contest "Tsukuba Challenge". Thus, fuRo has abundant expertise in artificial intelligence and autonomous driving control technologies. fuRo also developed the disaster site probing robot that is the only one in the world to be able to explore all floors of the demolished reactor building in the Fukushima Daiichi Nuclear Power Plant. It achieved various missions including an investigation that led the Japanese government to announce the "cold shutdown" of the troubled power plant. In July of this year, fuRo announced the future ride "CanguRo" which automatically deforms from robot to vehicle in Japan and the United States, and received a great response. fuRo is highly skilled in R&D from mechanical and electrical design to the artificial intelligence and intelligent sensing, as well as integrating all of those leading-edge technologies to create highly advanced robotic systems.